Well, it’s January, which means most of the country is still feeling rather bullish about eating healthy and finally getting into shape. You can count me in on that bandwagon, and while I do feel rather cliché for adopting a lighter diet (I’ve already made quinoa twice in the span of eight days — what is happening to me?? ), I’m hoping I can ride this nutritious journey all the way to the Xanadu that is Summer Abs. Of course, it doesn’t help that I spent ten boozy hours in Los Angeles’s Koreatown on Saturday eating things like fried chicken, cheesy corn, and kimchi pancakes. But I digress. 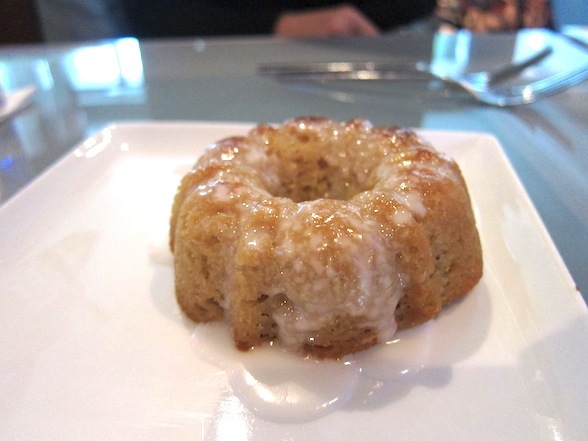 The point is that I’m aspiring towards a healthy lifestyle, and so I was most excited when my friend Devin Alexander invited me down to the Shade Hotel in Manhattan Beach to sample her healthy menu at Zinc Lounge. Devin, you see, cooks healthy. Real healthy. How healthy? She’s written all the Biggest Loser cookbooks (in addition to several of her own). In fact, Devin appeared on the show just last night to demonstrate her nutritious wares. 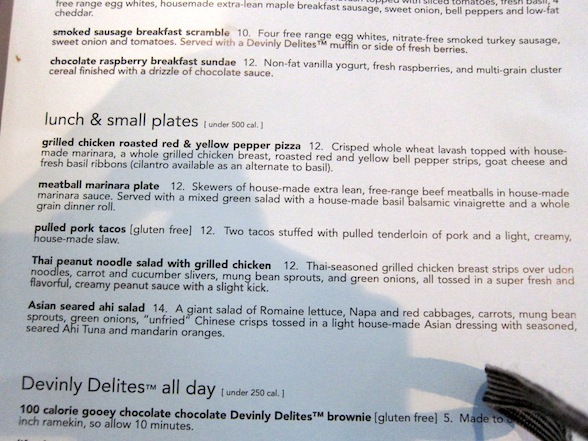 Clearly, I needed to dive into Devin’s low-cal menu (named “30 Days of Devinly Decadence”). I only had one concern: what if the food didn’t taste good? I mean, no disrespect to healthy dining, but it doesn’t always cause the tastebuds to sing. Would I be headed down an awkward path of me pretending to enjoy my friend’s menu?? Devin in all her glamorous, healthy glory. Part of the menu. Don’t get too attached: it changes every week… and this was from last week. Nevertheless, my cohort Lisa Timmons and I ordered the pulled pork tacos, the Thai peanut noodle salad, and the Asian seared ahi salad. First to arrive were the tacos, and let me just dispel any confusion here: these were delicious. 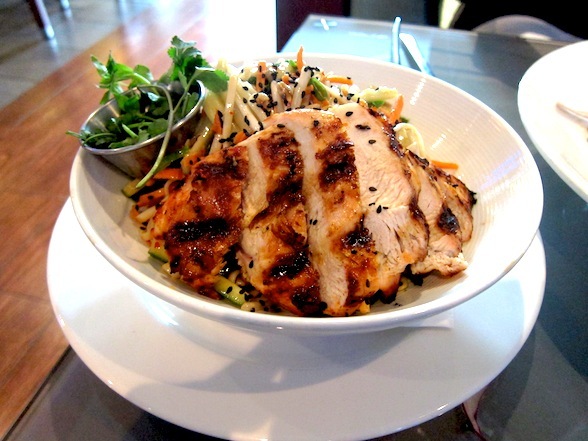 The pork was tender and perfectly cooked, the slaw full of vibrant citrus flavors. I added plenty of cilantro and jalapeño, both of which come on the side, for a zesty punch of freshness and heat. Definitely a winner right out of the gate. 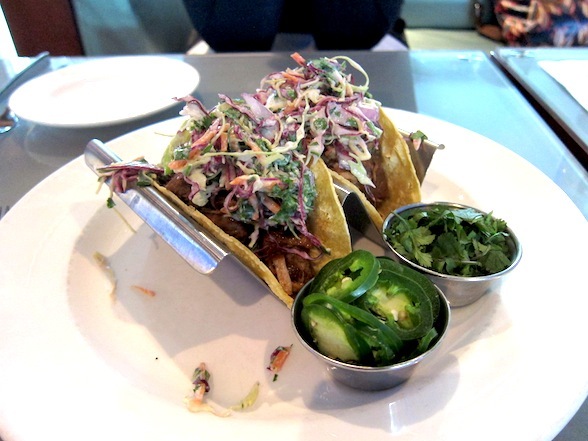 And how, pray tell, are pork tacos healthy? Well, Devin uses tenderloin, which is about a bajillion times leaner than the more common pork shoulder. 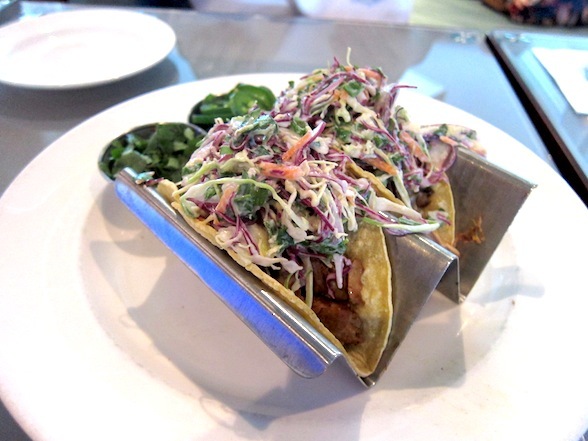 Plus, she uses yogurt in her slaw, and leaves the taco shells soft. Huzzah! 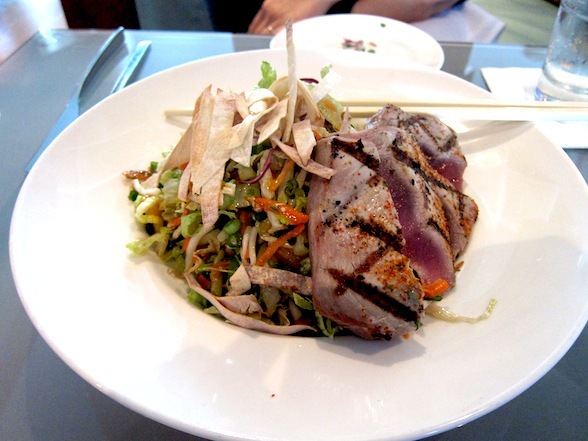 Next came a zingy and fresh seared ahi salad. Again, Devin uses big, bold citrus flavors in the vinaigrette to give this dish way more tastiness than one might expect. We were very happy. And rounding out the order was the Thai peanut salad. Very tasty. I thoroughly enjoyed this. And again, low fat, low cal. Also arriving for dessert was the 100 calorie “gooey chocolate chocolate Devinly Delites™ brownie.” While not as impressive as the lemon cake (I don’t anticipate many vegan desserts coming close), this dark dessert definitely scratched my chocolate itch, which is often all I ever want out of life. 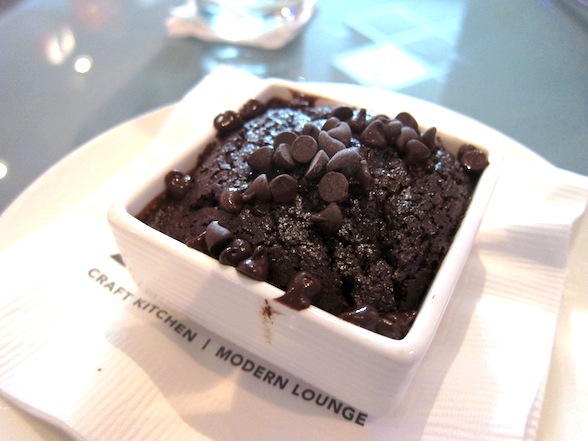 Make no mistake about it: this brownie was gone in 60 seconds. The good news is that I didn’t have to lie to Devin about her food. It was all extremely tasty, and considering that all the entrees were less than 500 calories each, the meal was fairly guilt-free. 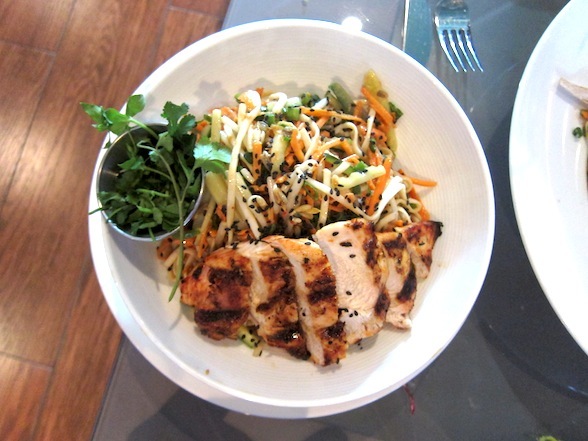 Healthy food, as it turns out, can be delicious. But here’s the bad news. Devin’s run at the Shade Hotel draws to a close on February 3rd. If you’re in the Manhattan Beach area, definitely check out the meal, especially if you plan on carbo loading later at MB Post. 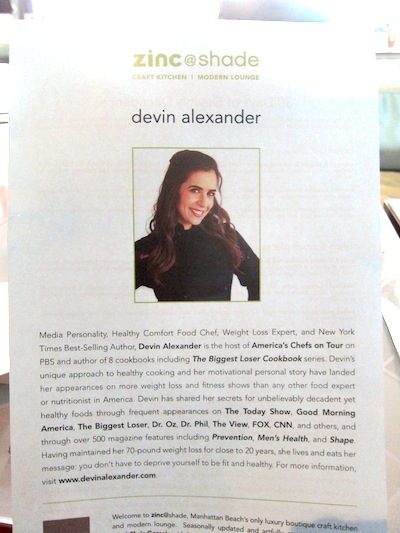 This entry was posted in Featured, Food, Restaurants and tagged Devin Alexander, restaurants, The Biggest Loser by Ben Mandelker. Bookmark the permalink. So proud of you! Pretty soon it’ll be quinoa every day and you’ll be the male version of me.